Don Jr. was born on October 25, 1964, and is a native of Colon, Republic of Panama. He completed his primary and secondary education in Jesup, Georgia. He is a graduate of Georgia Military College (AAS), Jacksonville Theological Seminary (University system of Florida) with a Masters in Christian Counseling, and a Bachelor’s in Religion. He is a graduate of Strayer University (Augusta Campus), where he completed his Bachelor’s in Business Administration (BA), and his Master of Science in Management (MSM). He is a graduate of Liberty University where he completed his Master of Arts in Theology, 2015. He is presently enrolled in Liberty University's Doctoral Program (DMin) with a cognate in Pastoral Leadership. Pastor Darden is a member of Upsilon Gamma Gamma Chapter of Omega Psi Phi Fraternity, Incorporated. Rev. Darden was called to the ministry at the early age of 14. He was first licensed to preach under the leadership of Elder McCormick, New Jerusalem Church of God in Christ, Ft. Greely, Alaska. 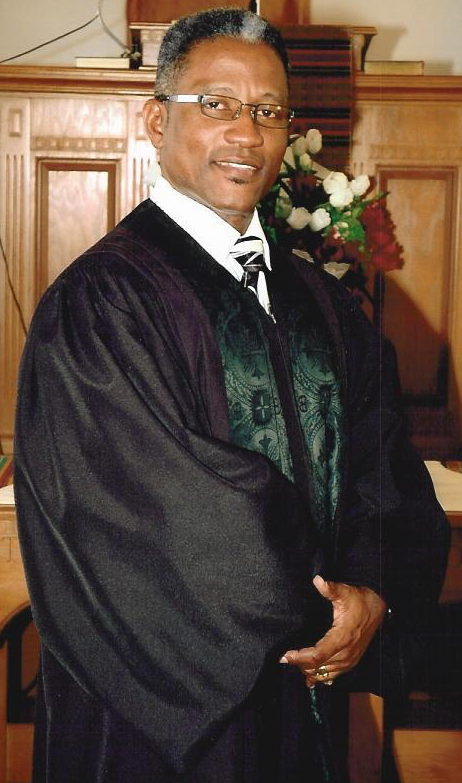 He would go on to serve as an Associate Minister at the Bennett Union Missionary Baptist Church in Jesup, Georgia, where he was licensed under the late Rev. Dr. Isaiah E. Boles. He served close to 22 years in the U. S. Army, both as a Field Artillery and Signal soldier, retiring in October of 2003 with the rank of First Sergeant. He is happily married to the former Ms. Sharon Hyson, who also served in the military and is a veteran of Desert Storm and Desert Shield. They are the proud parents of Stephon (27, Ft. Bragg, NC) and Alexis (24, Pooler, Ga). Rev. Darden’s functional call to Liberty Baptist Church came in January of 2001, while stationed in Korea. His vision for Liberty Baptist Church is being ‘United in the same Purpose’ (Ephesians 4:4-16 KJV). As Senior Servant, his Stewardship Ministry is to: Express God’s Person, Extend God’s Presence and Exhibit God’s Power as we live in the flow of the Spirit. Some of the key benefits of his Preaching (Prophetic) Ministry, Teaching Ministry, and Evangelistic Ministry are: (1) greater insight into the mind of God, (2) divine enabling to do the Will of God, (3) a time of refreshing from the presence of the Lord, (4) a deeper level of understanding the text, (5) gaining greater resources for understanding and applying the text, (6) experiencing a deeper commitment in our walk with the Lord, (7) a greater love and commitment to witness and WIN souls for the Kingdom, (8) relevant tools for tackling the task of “GO”, (9) and an opportunity to use your tongue to tell the story.